The Scientific Committee and panels are composed of independent scientific experts with a three-year mandate. They carry out scientific assessments and develop related assessment methodologies. 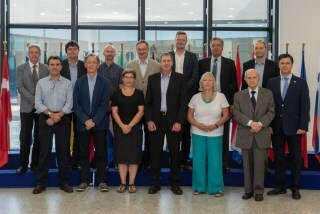 The latest mandate for the Scientific Committee and 10 panels began on 1 July 2018. Senior scientists, with experience of work within scientific bodies, covering all disciplines across EFSA’s areas of responsibility. Experts in epidemiology, microbiology, pathology, and exposure assessment. Experts in animal nutrition, toxicology, microbiology, exposure assessment, and environmental studies. Experts in food and feed safety assessment, environmental sciences, molecular characterisation, and plant science. Nutrition, nutritional epidemiology, human medicine, infant nutrition, pediatrics, dietary exposure assessment, food allergy and intolerance, toxicology, food technology. Experts in pest risk assessment, plant pathology, epidemiology, and ecology. Experts in chemistry, toxicology, ecotoxicology, exposure assessment and environmental sciences.